I sometimes wonder how this megapolis survives. The systems don't work. There is no plan for growth, let alone a vision for the future. The citizens are least cared for, forget convenience or anything of that sort. Take for instance the recent diktat by the authorities on the domicile of autorickshaw and taxi drivers. All drivers are now required to prove that they are domiciled citizens of the city for over 15 years for autorickshaw or taxi permits to be issued to them. The result has been disastrous. Overnight, the number of taxis and autorickshaws plying on the roads has dwindled. The ones that do selectively take passengers with impunity while the cops look the other way. I had been hearing such horror stories for the past few months from my colleagues. One of them pulled a few of these drivers to the police station at Bandra-Kurla Complex, but little happened. She then even wrote to Priya Dutt, the local Member of Parliament. But can lawmakers ever be expected to anything of substance ever? I was at the receiving end myself yesterday evening and today morning. Since my car had gone in for some repairs, I was forced to rely on public transport yesterday. 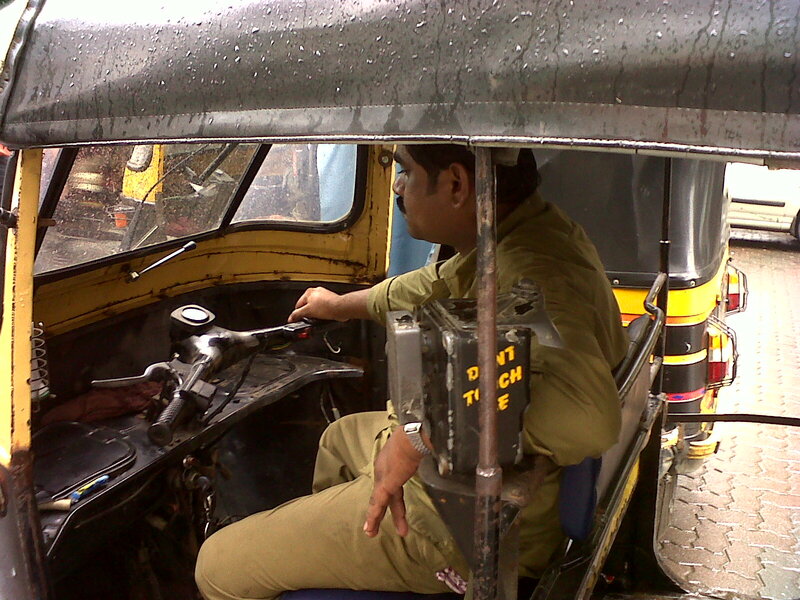 It took me 45 minutes in the rain to get an autorickshaw to get me from Bandra-Kurla Complex to Lokhandwala. The autorickshaw drivers just don't bother to even stop and hear out where the commuter wants to go. If at all they do, they would immediately speed off as though they had seen a ghost. Today, I had gone to Godrej Nature's Basket to stock up on groceries for the coming week. I again had a tough time getting an autorickshaw back home. One particular driver, in an autorickshaw with MH 02 RA 2800 as its registration number followed the usual antics. I threaten to report the matter to the cops. He said "No problem, please do. It's not my autorickshaw afterall!" Now that is the point. There appears to be an artificial scarcity of autorickshaws created in the city. The cops allegedly take protection money from the drivers to look the other way, while the drivers go all out to loot the commuters - overcharge (Bombay autorickshaw drivers who used to run by the meter now quote a fare, like Delhi or Chennai), tamper meters and refuse short distance passengers. And all this happens under the patronage of local politicians who own or finance the autorickshaws.